Does anyone know strength ratios that can work in a small space? These strength ratios are from weakest to strongest. A 1/9 compact gear ratio can be created by doing (12/36)/(12/36) (A 12 driving a 36 tooth which is on the same axle as another 12 tooth that is driving another 36 tooth) which only uses 4 of the axle holes (But be aware that you will need 5 holes to allocate because you need bearing flats). 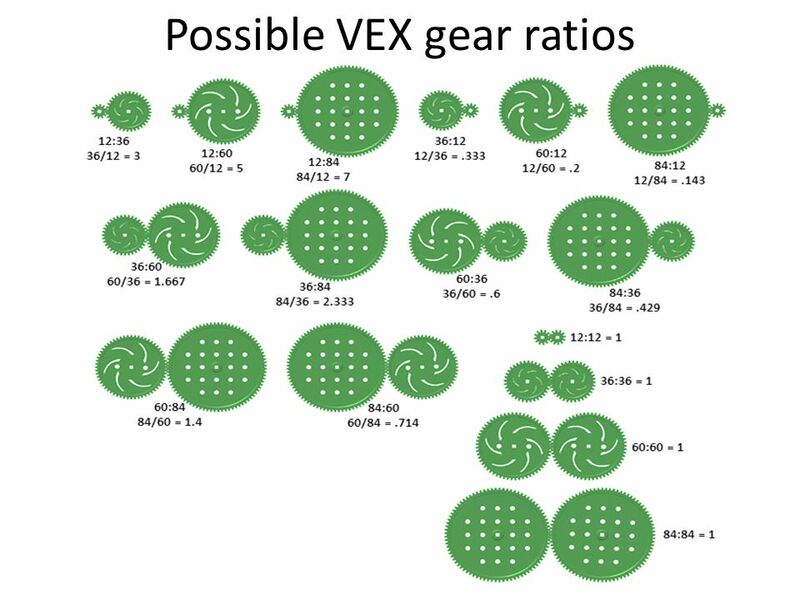 You left out a couple sprocket ratios available from 15 teeth, though due to 30 being double 15 over half of them are already present. Still, using 15T may allow fitting the same ratio in a smaller space. 15T requires more width, but you should be able to thin it down noticeably if needed. And then there is the worm gear, which gives 24:1, I think. Does anybody even use the worm and wheel outside of PLTW? Yep to open and close a clamp to grab the sides of the cap. 5090A used it for elevation control of their double puncher during NBN. Did I hear 5090a? That’s a local team that I migh be joining! There is a video up somewhere of a nice variable transmission that takes advantage of the worm gear being very resistant to being back driven. Generally I would think the ratio makes it too slow for most applications, but it could probably work well for a gear shift type of device and other things that don’t need to move far, especially when you want direction shifts. Bevel gears, on the other hand, I have seen used more. There may be a gear ratio from the non-45-degree bevel gears, too. The 45s are 1:1. I’ll have to check the others to be sure. I think there are 3 sizes of bevel gear. I’m in PLTW and we have at least 2, maybe 3. Yes, there are three sizes, but there are only two pairs. I think the pairs are 45 degrees with another 45 degrees and 30 degrees with 60 degrees, but I’m not sure on the latter so I have to check them to confirm the gear ratio. Looks like the other pair is 32 and 16 teeth, so not a new ratio at 2:1, but at least there is that ratio available when making a 90 degree turn. Do you know where I can find 15T sprockets? I didn’t see them on the VEX website. 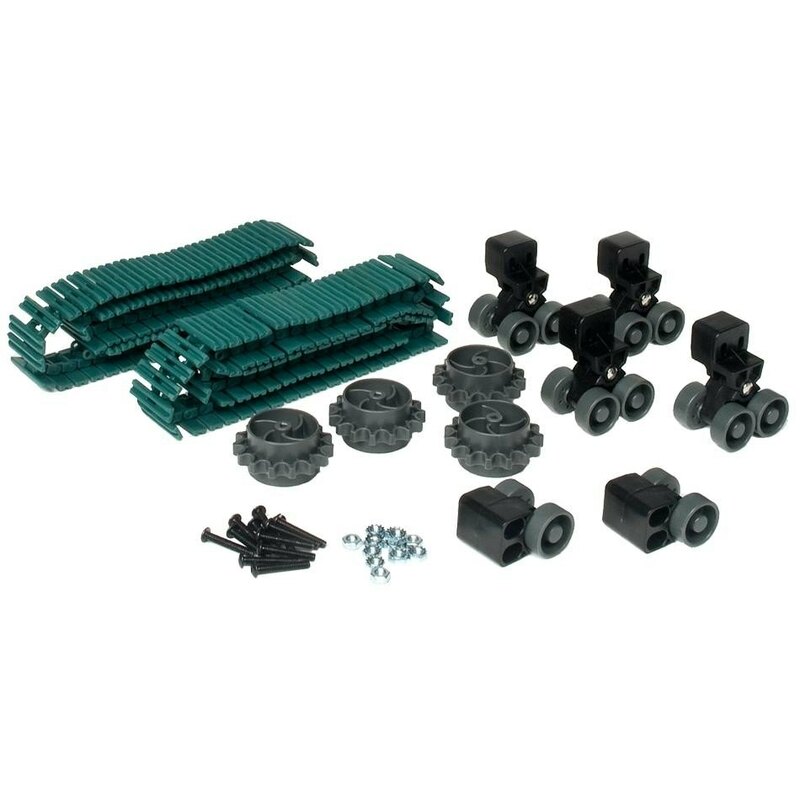 They’re called “Tank tread drive/idler wheels,” but they’re just 15-tooth sprockets with wider sections for the tread to rest against. If it’s the type of gear I’m thinking of, 77321J used a worm and wheel on their mobile goal intake last year.